Bumbleride is reshaping baby mobility in a way to flow seamlessly into your lifestyle. Designed around the idea of simple operation and intuitive function, the Bumbleride line is easy to use and ergonomic for baby. At Bumbleride, we strive to make products that are better for the environment and better for you. That's why we use a unique blend on every Bumbleride. Whether your family is urban or active, Bumbleride has the perfect system for you. Indie Twin has an optional latch on adapter bar for the Maxi Cosi Mico, Prezi or Cybex Aton car seat. 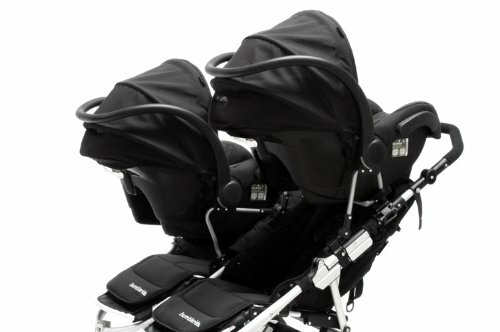 Compatible with one or two Maxi Cosi Mico, Prezi or Cybex Aton car seats. The optional Maxi Cosi adapters make it easy to latch in 1 or 2 Maxi Cosi Mico Prezi or Cybex Aton car seats. The adapters are available separately and are identified as lower and upper adapters. The lower adapter can be used by itself, however, the upper adapter must be used in conjunction with the lower. If you have any questions about this product by Bumbleride, contact us by completing and submitting the form below. If you are looking for a specif part number, please include it with your message.